Victims, villains and rescuers - Collier Brown & Co.
Dudley Do-Right was the hero of a segment of The Rocky and Bullwinkle Show, a cartoon entertainment show from my youth. Dudley was a dim-witted but cheerfully optimistic Canadian Mountie who was ever trying to apprehend his nemesis, Snidley Whiplash. Dudley was romantically interested in the lovely Nell Fenwick, daughter of Inspector Fenwick, commander of the Mountie Station. Nell was a frequent target of the ne’er-do-well Whiplash. 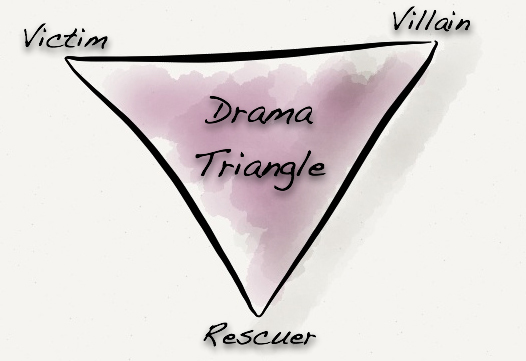 the rescuer, who intervenes, seemingly out of a desire to “make things better” or help the underdog. Every victim needs a villain. To complicate things a bit, these roles are dynamic: when the victim feels hurt and seeks revenge, he becomes the villain (persecutor). The persecutor (villain) may be attacked by the victim or rescuer when they go too far, or may feel guilty, and thereby becomes a victim, or a rescuer. The rescuer feels the hopelessness and frustration of trying hard to “make things better” or “fix things” and engages in blame, or is blamed, becoming a persecutor, or a victim. You probably feel like you need a Playbill to keep up with who is in which role! O.K., this is not genuinely responsible behavior. Each player is acting out their own selfish “needs.” The reason this situation endures is that each one gets their unspoken, and often unconscious, psychological wishes or needs met. They feel justified without having to acknowledge or deal with the broader dysfunction, or harm done, in the situation as a whole. Some victims “go pro.” The Urban Dictionary defines “professional victim” as one who claims victimization whenever things don’t go their way. Some are burdened by perpetual victim syndrome. Those are the people for whom wrongs can never be righted. The perpetual victim loves to play on your sympathy and is ever attention-seeking even if the attention is negative. They love the attention that a life of drama creates for them. More on this in the next post. It’s not hard to imagine the distractions this kind of drama can create in business. These behaviors, especially the victim role play, tend to be self-fulfilling. They can also be self-limiting in that they help keep game-playing people from higher levels in an organization. Some of the time. So what’s a person to do? Two things: first, don’t play. The “game” doesn’t work if you don’t assume your assigned role. Second, someone has to be the “adult,” the one who responds to the “here and now,” dealing with things in ways that are not unhealthily influenced by the past. The idea and need is to see people as they are rather than to project a (or accept an unhealthy) role. Let’s leave the drama to Dudley, Snidely, and the lovely Nell. All of this is “right-on.” Informative and enjoyable reading.